La Tazza D'Oro Coffee Trial Set | Great taste & safe money! The golden blend of the roasting house La Tazza d´oro. The result is a complex espresso coffee, nuanced, clear in expression and with a sparkling fruitiness. In the aftertaste it is chocolaty and fine bitter. The low addition of 10% Robusta beans gives this extremely fine espresso coffee a fine, nutty crema. The 30% Robusta makes this coffee even more attractive when it comes to thicker crema. These properties make Gran Miscela the perfect choice for the owner of an espresso bar and all those who have the same high standards at home, as a base for cappuccino and latte macchiato excellent. 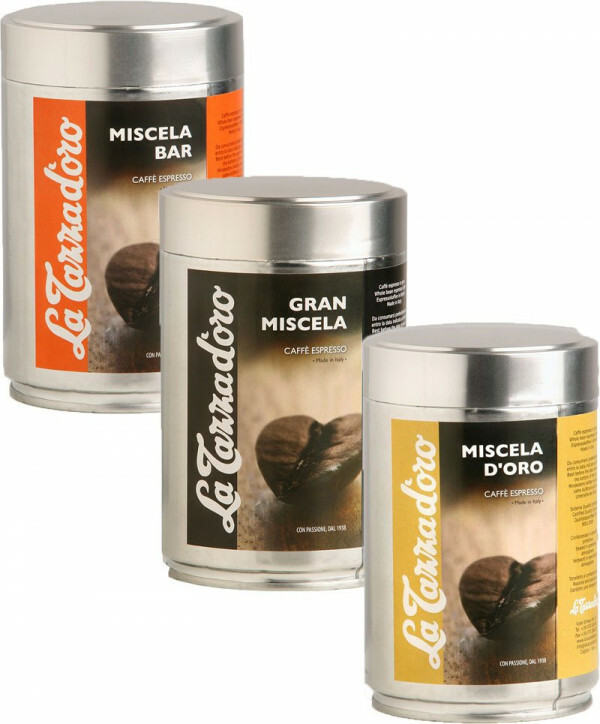 La Tazza d'oro Gran Miscela is an espresso coffee thanks to the 70% proportion of the finest Arabica beans, which inspires the front part of the tongue with a fruity, finely balanced acidity and whose chocolaty note on the back part of the palate has a pleasant aftertaste for a long time. The 30% Robusta make the coffee even more attractive when it comes to thick crema.